On September 29-30 “PROMIX” Ltd. 2015, jointly with the representative office of the company Megger and PJSC “Kievoblenergo”, organized and held a seminar of working with high voltage electrical laboratory Compact City, produced by Seba Dynatronic company, which is part of the Megger group of companies. - the theoretical part on electrical laboratory Compact City and other high-voltage equipment, manufactured by Seba Dynatronic. The audience had the opportunity to learn about products, ask questions to the specialists of the company Seba Dynatronic, including the experience of solving the problems of electric power equipment operation in the European countries. - presentation of Megger’s equipment for parameters of low voltage electrical networks measurement, in particular, the demonstration of the DCM300E clamp, DCM340 digital multimeter, AVO410 digital multimeter, parameters of the loop a short circuit meters LTW325 and LTW335 EUSC EUSC, DET14C clamps ground meter, DET4TCR2 digital earth tester. - practical part on the Compact City electrical laboratory. The work on fault location of a 10 kV live cable was successfully implemented , the nuances of connection between the lab and the transformer substation were considered . 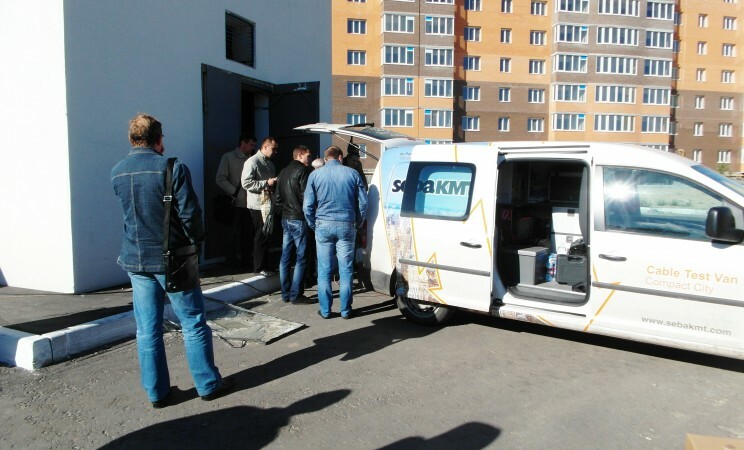 Due to the large interest in relation to the Seba Dynatronic and Megger products, on the next day, October 1, 2015, further demonstration of equipment was held for PJSC “KYIVENERGO” specialists, The additional seminar was attended by representatives of all Kyiv electrical networks departments. After the theoretical part there were successful tests of cables in PJSC “KYIVENERGO” service .